With a sweet woodsy flavor, the Blue Oyster is our most versatile mushroom. 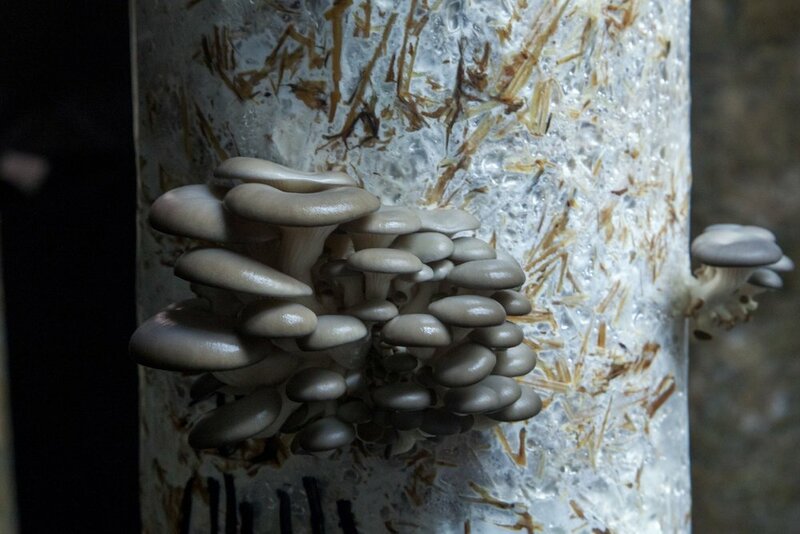 Dried Blue Oyster Mushrooms are in our Cream of Mushroom Soup and Salt Mix. Have fresh mushrooms year-round by growing your own. Grow Kits and Spawn available. Congratulations, you are on your way to becoming a mushroom farmer! To ensure success, please follow the instructions below. What You Need: clean scissors, strong tape, a tray with edges (cookie tray or shallow plastic bin), small trash bag (humidity tent), wooden skewers (the tent poles), and a spray bottle for misting. Take clean scissors and cut two holes in the bag, one on either side. The mushrooms will grow out of these holes in search for oxygen. The holes should be cut in an x pattern a couple inches wide. Try not to cut too deep. Place bag on the tray, this will be its new home. Push all of the air out of the top of the bag. Fold the top of the bag and tightly tape it down. This ensures the mushrooms will not grow on the top. Now it is time to set up the humidity tent. Mushrooms are 90% water and require high humidity levels. Make sure the mushroom bag is on a tray. Take four wooden skewers and poke them in the top four corners of the bag at a 45 degree angle. The skewers should be 1-2 inches deep. Now take the small trash bag and place it over the bag and skewers. This creates a nice humidity tent for the mushroom bag to live in. The bottom of the trash bag should rest inside the tray. Lift the side of the trash bag and mist inside the humidity tent daily. You want to see water droplets on the inside of the humidity tent and on the mushroom bag. If your house is dry, mist inside the tent twice a day. Remember, the bag is living and if the humidity or temperature is too low, mushrooms will not grow. After a couple weeks of daily misting, primordia will form in the holes. This is the most delicate stage. So, make sure the humidity in the tent is high. During the following week, the primordia will turn into tiny mushrooms. Daily growth will be obvious. When you peak under the tent, mist the mushrooms. By the end of the week, the mushrooms will be almost ready to harvest. The caps of the mushroom will slowly curl open to release white spores. You want to harvest the mushroom before the spores release. So, pick the mushroom while the caps are slightly curled under. If the cap is flat or curled upward, harvest immediately. To harvest, hold the mushroom cluster at the base of the stems at the hole opening. Twist and pull. Some sawdust will come off as you harvest. Clean the holes of any remaining mushrooms. The mushroom bag will continue growing and produce at least one more harvest out of the original holes. Go back to step 3 and continue enjoying your delicious mushrooms.